Each Sponsor’s offer is personally delivered to a potential customer. Not left on the doorstep; not sent in the mail. Our Greeters offer word-of-mouth assurances that every business included is a solid, reputable business. They’re in good company. Each Sponsor’s promotional items and brochures are included in our attractive and reusable red Housewarmers Gift Bag. Each Sponsor has an eye-catching Gift Certificate in our exclusive Gift Book. Residents are enticed to try Sponsor businesses with these offers. Each Sponsor receives an ad, and a listing and map of their location in a useful Community Guide. Customized for each territory, the Housewarmers Community Guide is designed to be kept and referred to again and again. Each Sponsor is listed on the local Housewarmers affiliate’s website with links back to their website. There’s also space for their logo and a printable special offer to appear in their listing, too. The ‘Front Porch” email newsletters to residents contain additional offers from Sponsors if they desire. Residents eagerly sign up to receive these newsletters, containing local information, business spotlights and coupons from our sponsors. And due to the popularity of these newsletters, local residents often sign up too. You reach new people every month. Each Sponsor receives the names and addresses of the residents greeted each month for follow-up marketing. Studies show that it takes repeated touches before a prospect remembers a company’s name or visits their business. 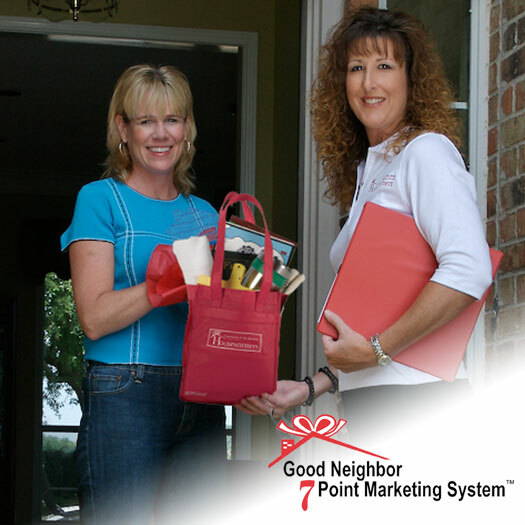 With Good Neighbor Marketing℠, your business has the opportunity for multiple touches. All for one low price! Learn more about becoming a Housewarmers Gift Bag Sponsor! Call us at (469) 387-9620, or fill out our convenient online form and we’ll respond right away.